We’ve decided to show you how you’ll be navigating the cosmos in Starbound. You’ll be going from planet to planet, system to system, and sector to sector. You’ll discover odd new worlds and species as you bravely travel where someone may or may not have gone before! 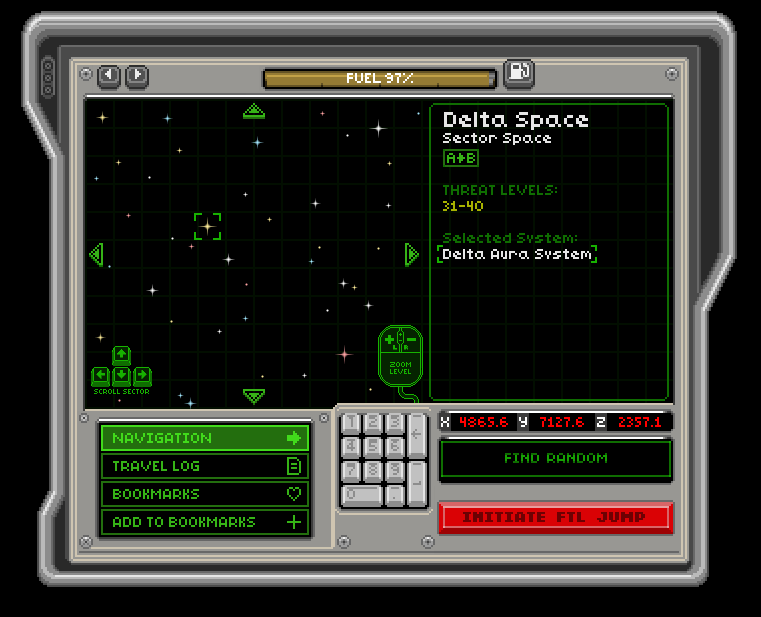 Accessed from your ship’s console you’ll be able to open the Navigation Menu. 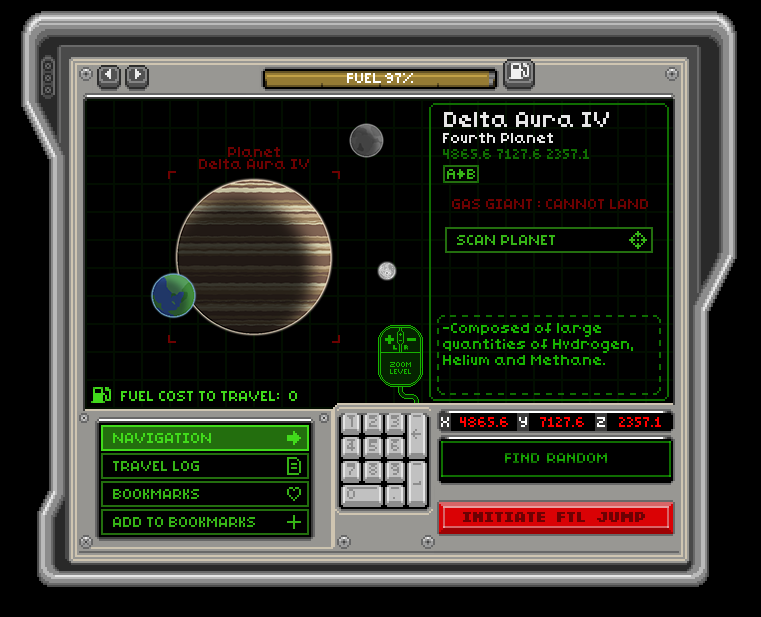 Currently in this example you’re in orbit around a gas giant named Delta Aura IV which you cannot land on. You may scan the gas giant for resources and other treats and then be on your way. You click on one of the gas giant’s moons. It is called DAIVS-II, a scientific name you can change on a whim. Revealed is some basic information about the moon including the fact that you may walk on it. 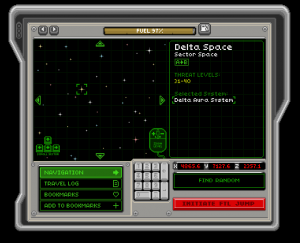 Initiate the FTL to go into orbit if you want but for now we’re zooming out! 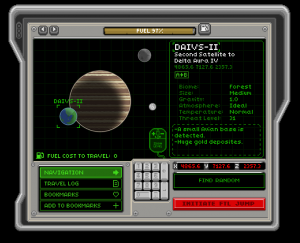 With a right click our view becomes a view of the local planetary system. You may click on any of those celestial objects to get basic information on them or even visit them. Make sure you have enough fuel! With another right click you’ll zoom out further revealing a much larger area. Each of those is a dynamically generated planetary system with suns, worlds, and even more to discover! Walk on planets, moons and much more as it’s not only planets and moons that you may walk on and visit. 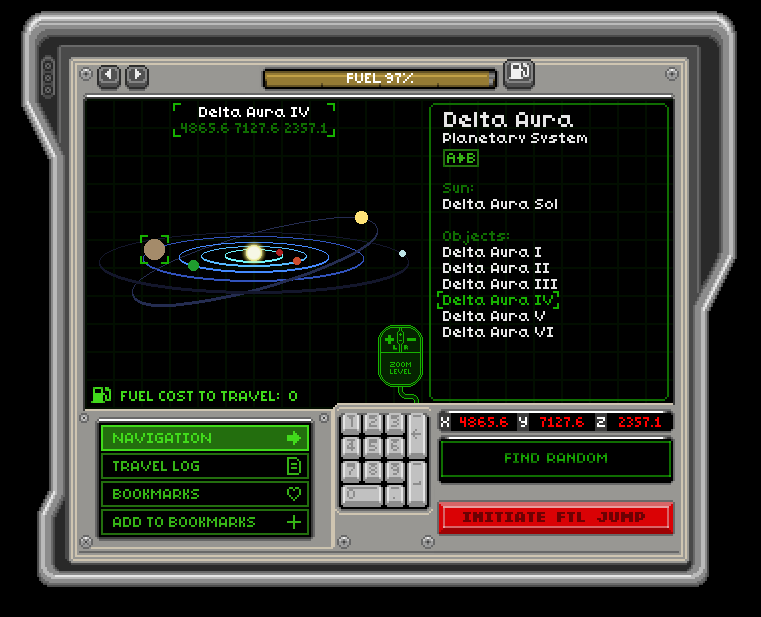 Click on them to view their info (there’s no fuel cost to simply look) and travel the stars! I think with this brief glimpse you can see how BIG this universe will be and hopefully how fun it will be to explore, share discoveries with friends via seed coordinates, and do so much more. Now, this is all subject to change as we continue to develop the game and test it out. Everything is a work in progress. Nothing is set in stone but we thought we’d give you a look into what we’re currently doing with the development of the game.